More information will be released within the comming months as we get closer to the Marathon itself. Updates will be announced on our Facebook page @CWRUFilms as well as through the 44th Annual Sci-Fi Marathon Facebook event page found here. 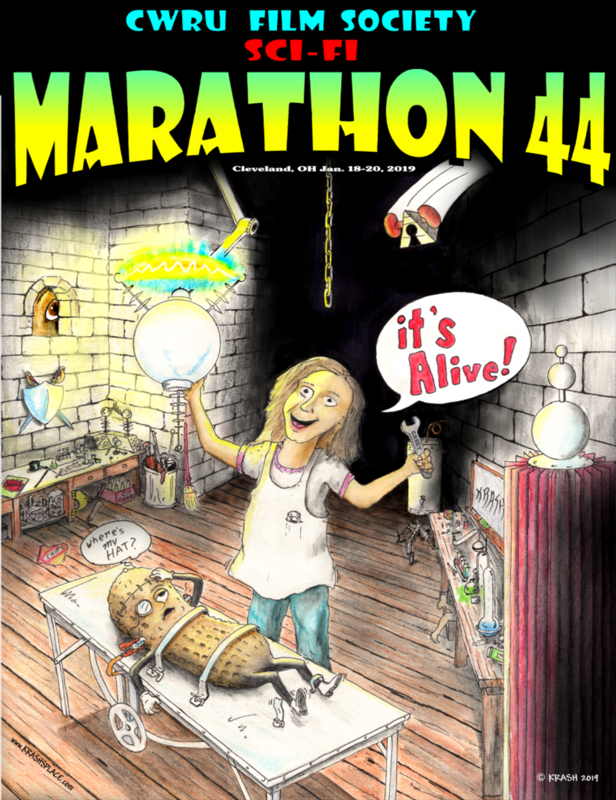 Be sure to check the 44th Annual Science Fiction Marathon Facebook Event for the most recent information. See below for more detailed movie descriptions. Check out the two concessions stands for a variety of snacks and drinks! Food offerings, times, and cost subject to change. Check back for more information closer to the event. During marathon, real-time updates will be posted to the CWRU Film Society Facebook Page. Free parking is available in both Lot 01A and Lot 44. Lot 1A is open for entry between 5:00 pm and 9:00 pm on Friday, January 18th. Lot 44 will be available after 4:30 pm on Friday. If you arrive earlier than 4:30 pm, you will have to pay for parking in the Veale Parking Tower (lot 53) at the posted rates. If you park at a location other than Lot 44 or Lot 1A, we are not responsible for any parking tickets or loss of access to your vehicle. It is highly suggested that marathon attendees stick with the lots we recommend. If you arrive before 6pm on Friday for the Marathon, there will be NO OFFICIAL SPACE for you to camp out. If you intend to arrive early, please anticipate making your own arrangements. Admission information is subject to correction. Please check back before finalizing your plans. Pricing for this year's science fiction marathon is $30 per person. Tickets go on sale Friday, January 18 at 6pm in the lobby of Strosacker Auditorium. No one under 18 admitted without parental supervision. Pre-sale tickets will be sold Monday, January 14 through Friday, January 18 in Tinkham Veale University Center. A $25 per ticket price will be available to CWRU faculty, staff, and students as well as employees of University Circle businesses. Other members of the community will be able to purchase for $30. All wristbands will be available for pick-up the evening of the event when the doors open. Pre-sale tickets do not allow you to enter the theater before 6:00 pm. No alcohol. No glass bottles. No fire hazards. Bring deodorant. Bring a toothbrush. Don't forget your towel. Space for sleeping bags is available on a first-come first-served basis. No one under 18 admitted without parental supervision. All bags are subject to inspection before admittance. STAGE RULES: It is no longer possible to remove the classroom A/V equipment from the stage (stage right/house left side) for Marathon. Aside from losing precious mattress/sleeping bag real estate, we must prevail upon our audience to not fiddle with, place, store, or spill food & beverages on, fold, spindle, mutilate, or otherwise in any way disturb that equipment. NOTE: Due to continual construction from the Summer before the Fall 2018 semester, the rear door of Strosacker Auditorium is closed. Please use the front entrance connected to the main quad. Rules subject to change at the discretion of the CWRU Film Society. Additional rules may be added due to the renevations in Strosacker Auditorium over the Summer before the Fall 2018 semester. Check back closer to the event for any additional rules. Days ago, Trent awoke with no memory of his past. Since then, sinister men have pursued him constantly. He manages to stay one step ahead of them by following the advice of his hand. Made of glass and apparently capable of speech, Trent's hand can answer many of his questions. But it cannot tell him who he is or why his enemies seek him until he finds all of its fingers. The only trouble is that they're in the hands of his enemies.